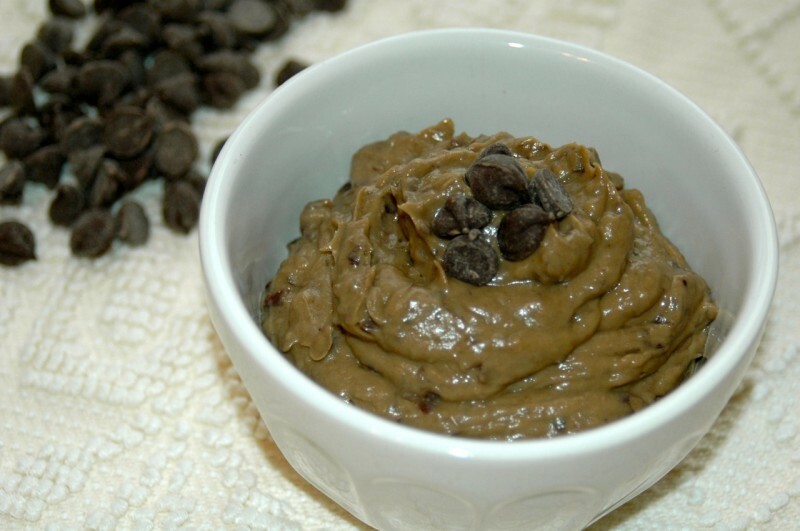 This chocolate black bean avocado pudding is deceptively delicious! 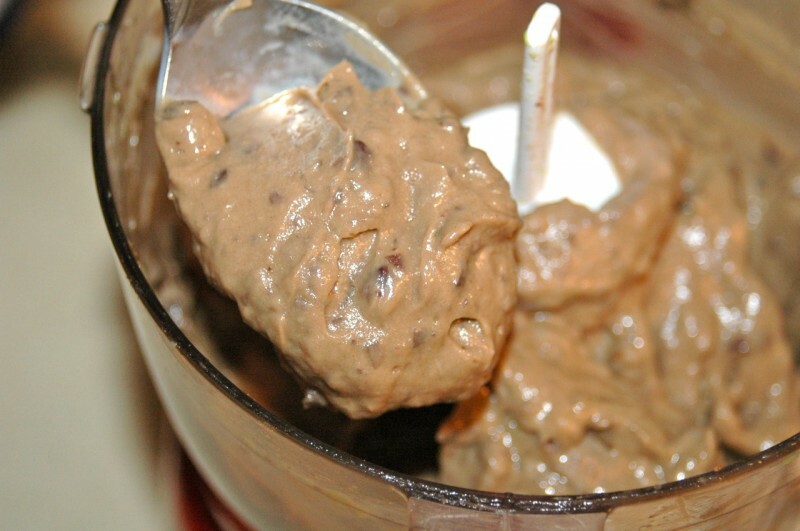 This raw, vegan treat has a thick, creamy, mousse-like consistency and is packed with healthy omega 3’s and protein. 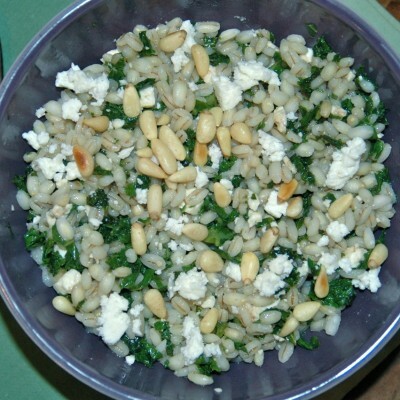 This impromptu recipe came about a few weeks ago as I was about to prepare my (sick) son’s morning snack, which had been (for 5 days in a row) Cheerios because he couldn’t stomach anything else! (I never thought I’d see the day when that would happen!) To my surprise, he was feeling a bit better that morning so I thought I would give him a special chocolate treat, but still keep his morning snack relatively healthy, of course! 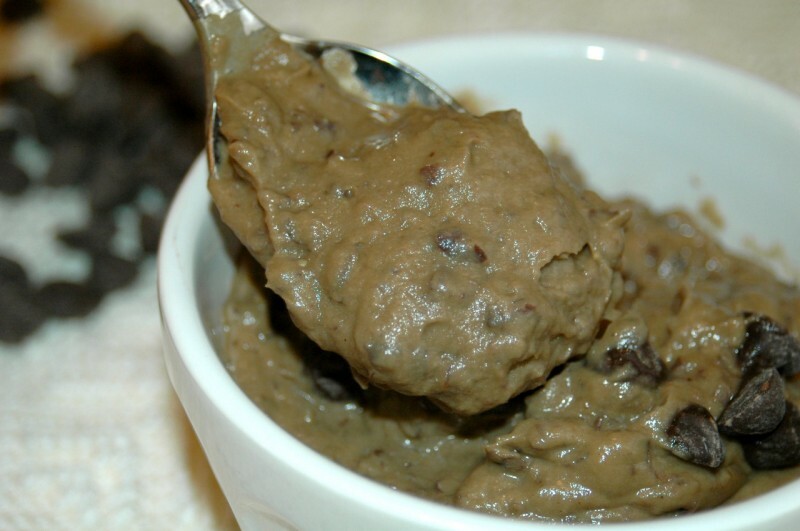 I wanted to change up the same old banana, avocado, and carob pudding (which he loves!) so this time I swapped the banana for some leftover black beans in the fridge (why not?! 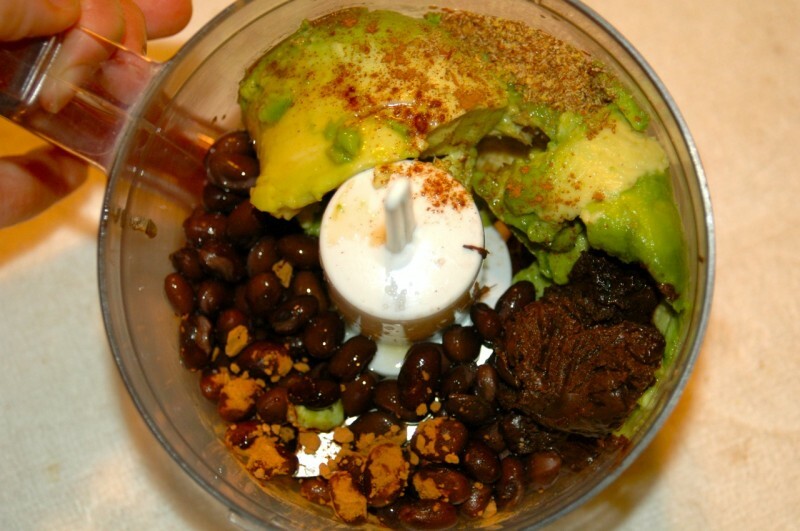 ), adding some melted chocolate chips, milk, and a few healthy and tasty additions. 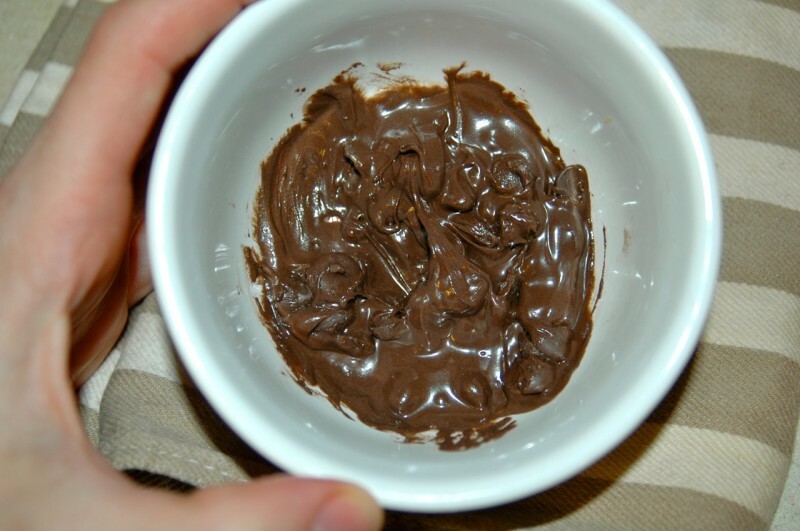 Melt chocolate chips in the microwave for about 20-30 seconds. I suggest heating them in 10 second intervals to avoid overheating them, which will make them seize (overheat and turn into burned dry clumps of chocolate!). Add all ingredients (except for the milk) to a small food processor and purée until smooth and combined. Once combined, add milk 1-2 tbsp. at a time and purée until blended. Continue to do so until you get the desired consistency. The recipe calls for 6 tbsp. of milk, which makes a light, creamy mousse. 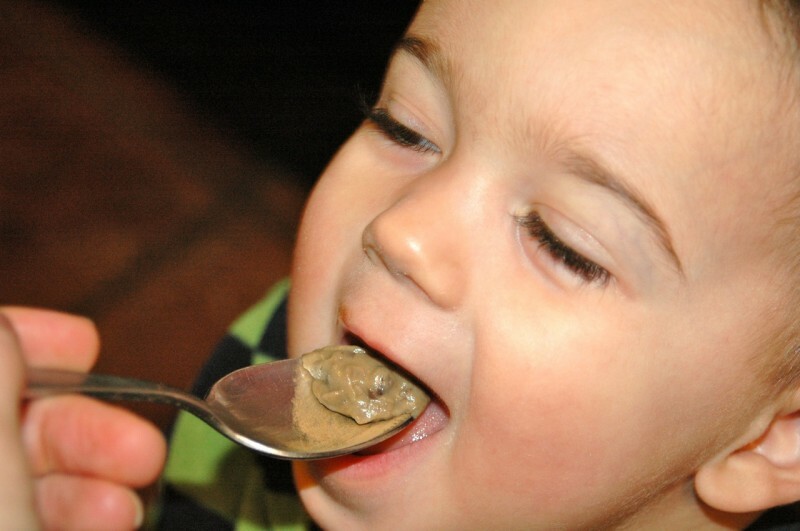 You can use less for a thicker consistency for toddlers or more for baby as a first food. My taste-tester is too young to ask…or too hungry to care! Someone got their appetite back!! Someone also crashed mama’s photo shoot! (I stepped out of the room for only a second and when I came back I caught him red-handed!). He just couldn’t hold out any longer! Look at those cute stubby fingers trying to sneak a spoonful! Leave in the fridge to chill for at least 2 hours. For older toddlers, garnish mousse with coconut flakes, crushed pecans or add more chocolate chips for a crunchy bite! This is happening at our house. I’m going to have the teen help me make it for her little brother. She’ll think we’re ‘tricking him’ into eating healthy, but really the joke will be on her because I know she’ll want to try (and then love) it. Her eating habits are getting a bit off kilter lately (think, ‘moooooom why don’t we have any Doritos in the house? -_- ). That’s awesome! It sounds like it’s about time to clean up that diet, lol! Thanks for sharing this! I made this tonight as I’m watching my calories and on the lookout for nutrition-dense meals (and treats). I was pleased with my version. I subbed agave for the sweetener and used 2 teaspoons of cocoa powder. I did not add any flax seed or chocolate chips. For my tastes in the future I will add less black beans. I like black beans, but I like them alone or in certain context, not in pudding context and this time I tasted too much black bean. The resulting flavor reminded me of the red bean paste flavors one might find in some Asian sweets. I used a standard food processor to prepare this. Also, my avocado was just becoming ripe, so next time I would wait longer. I will try this with nuts for breakfast tomorrow! I love how you modified the recipe! I’m always modifying recipes (even my own) to suit my own or my kids preferences, or depending on my mood at the time! Thanks so much for the feedback! 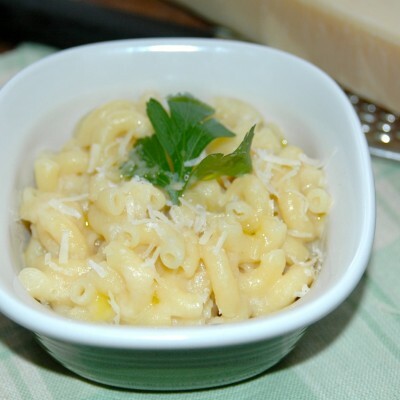 I hope you try some of my other recipes (and post more feedback!). I don’t have a baby, but just had a bunch of teeth removed (for braces!) and I found this recipe. I used almond milk instead of coconut milk and only 1tbs of sweetner (honey). I also had to use a little bit more almond milk than the recipe calls for because I don’t have a food processor, just a Vitamix. 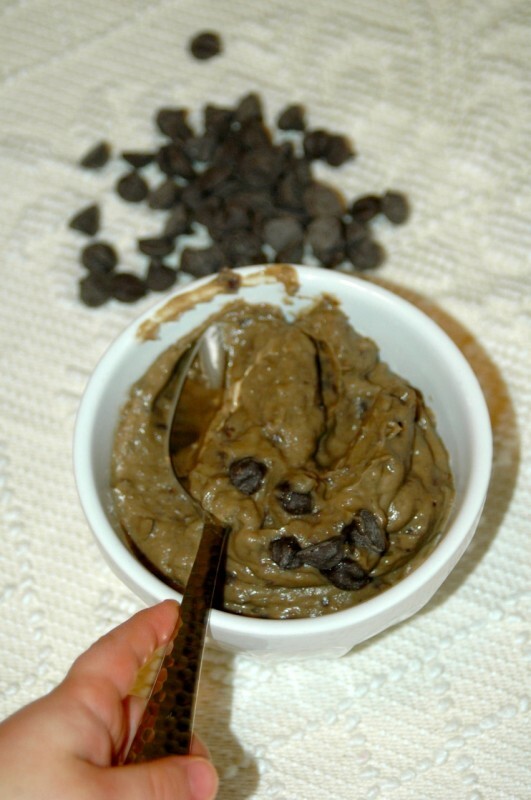 It’s so delicious, actually tastes like chocolate pudding, except I know it’s good for me! 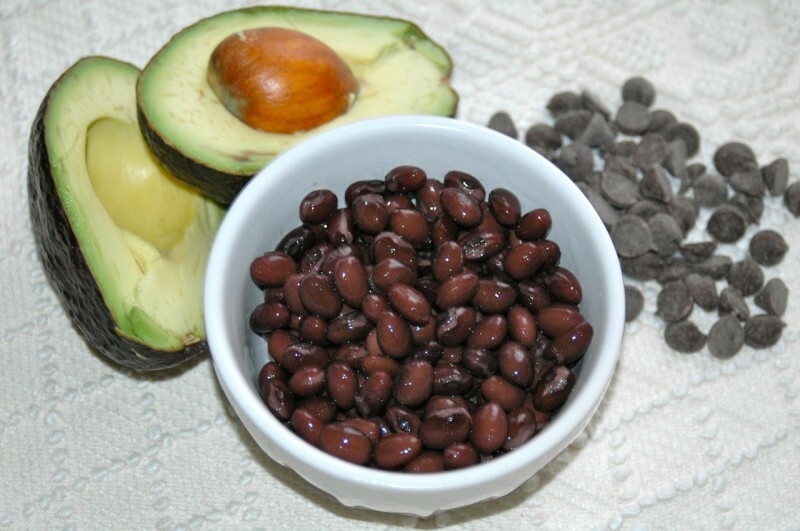 I would never have tried to put all these things together – avocado, beans and chocolate but my kids love all of them individually so I may just have to give this a try. I’m sure they will love it. Unsure if I will. Hahaha… I like avocados and chocolate separately!